The viol or viola da gamba [ˈvjɔːla da ˈɡamba] is ony ane o a faimily o bowed, frettit an stringed instruments that first appeared in Spain in the mid tae late 15t century an wis maist popular in the Renaissance an Baroque periods. ↑ "Viola da gamba" denotes a faimily o instruments distinct frae the violin faimily, or "violas da braccio." 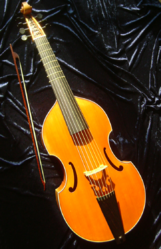 Currently, the term "viola da gamba" wioot qualification generally refers tae the bass viol. ↑ Woodfield, Ian; Robinson, Lucy. Viol [viola da gamba, gamba]. In: Sadie, Stanley, ed. The New Grove Dictionary of Music and Musicians.Vol. 19. London, UK: Macmillan Publishers Ltd; 1980;791-808. This page wis last eeditit on 19 November 2015, at 18:50.